Poker Information .. Forum Issue report.. Whats needed to make this place more active? Switch to Forum Live View Whats needed to make this place more active? Not sure where this thread should be posted so if in wrong spot i know a Mod will put it in its right place. Ok a quick question what would you like to see change in here to make it more active? I have seen a few of our older members post up a thread in here and getting little response, now this will put them of from posting up again. So what is needed to encourage chat in here and get it active again? We did have a very active Mod in here who was the one that invited me over to take a look and he always had good input in his threads and joining in others. Maybe if you made all forum games like the Mod game where you have to have 5 posts in a month to play it, mind you that could completely kill this place and be a bad move. How about having a sat game where a forum member can win a seat to a live event and a 20% stake of any winnings would be put back into the forum. This would create the members railing the player like we use to have in the super stack games a few years ago. We have seen many members go over the years, can we not send them an email and just ask them to take a look back in? You never know they might start posting again. When i have tried to get people to look in they have found the layout confusing and when you see old posts from years ago they will think its a dead forum. Can we not put all inactive threads over a year into an archive where we still have them but are not cluttering up the place. Anyhow im hoping i get at least 1 reply to this and if you do post up what you would like to change in here or what you think will make it active again. The mods are constantly asking for things but we are dependent on the guys @ 888 to decide if they want to implement them. We always welcome new ideas so if anyone has any please post them and we will pass them on. Are players encouraged to setup an account here when setting up their poker account? If not, why not ask them if they wish to set up a community forum account and explain the benefits of doing so. Don't think 888 give this forum any credence, I think they give more to others like Pocketfives and 2+2. When I found this place back in 2006 it was vibrant and the players here where very pro active in giving others so much help. I use to support others, even putting up entry fees into games. When Geoff Incbus1 was running it for Pacific and played a comp over serveral weeks and the player Peeko3 who won it got to play a live event on a ship/liner near Brazil. Why 888 don't do this sort of thing again beggers belief, but they just seem to want promote a few pros who to be honest do diddle squat to promote the site. On another note don't really like any of the mtts on here anymore as everything is rebuys or another name for rebuys 2nd chance, 2nd chance doesn't mean 999 rebuys if you lose your chips. 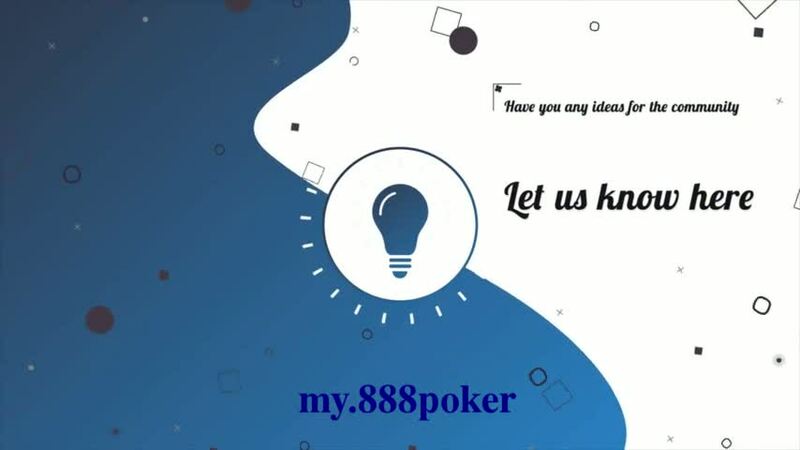 Infact how 888 has changed has killed my enthusiasm to play online poker fullstop. Gone from playing probaly 8 to 10 mtts a day to playing the odd freeroll if I can be arsed to. You been here a lot longer than me Shiny so you have seen the ups and downs in here. We have seen to many good players leave and move on to other forums, but im sure they would come back if we could get this place buzzing again. It was a great achievement for 888 to sign Chris who is an online master and i was hoping he may take a look in here and post ( read his book if you get a chance, helped me heaps). I would love us to have a game in here where we could send a member to a live event, maybe they could look at that. How about an end of year game where you could win a seat to a big event? Or even a monthly game where you could win some merchandise, that way we are prommoting 888 when we wear it out. There must be ways to get this forum out to more people. Its a shame as we have lost a lot of members as 888 stoped certain countries playing there, hopefully they come back, as i miss Goblin and Rods posts. Anyhow im rambling now, hopefully we can get our old members back some how, and get new ones in. John thats a good idea. Hope your having GL on PP, try get back over here and play a few sngs and get back posting as you and Ricey brought a spark back in here. Cheers Slim my luck has been good on the sngs at PP but I am getting tired of the lack of chat so I have made a small deposit here and will play $1 games until I build it up a bit more. I will continue to play both sites at same time to keep myself entertained. They do listen on PP and the chat which wasnt even working right when I was there is now fixed and the chat bubble suggestion is with their team. If 888 listen to its clientele when they have ideas or feedback which can help the site they would be doing much better. I just wonder how many people have left as a result of the chatbox issue which is easily resolved. 888 for whatever reason want more space on the table so why not just re-instate chatbox where it was and have a button in the corner to hide it and another to detach it from the table if a player wishes to do so. I seen that graph you put up recently. Mighty results m8 and crushed a number of mtts too. Keep it going m8. Take the cancellation of the bash for example, it didn't happen in 2017, and why should it? everybody wants to go and nobody wants to post, and I know for a fact that people turned up at Birmingham who had joined but never posted, and haven't posted since, just because they lived there and they were "members" where's the value for real members? Yes Slim it would be nice to be able to win some live seats again, but I have 2 questions! 1 do we deserve them in our current state? and 2 shouldn't they be for active members prepared to promote this forum? Good to see you back posting. Your input is missed in here as you did keep threads active and was always helpful to members, your the reason why im here as you told me many years ago about this place when i was on a final table with you and i believe TOTS and you told me to take a look in. I do hope that this thread is read by the people that can make a change to this place to make it a place like it use to be.